The Nativity storyline runs throughout popular culture, but we often fail to notice even at Christmas time. Whether we don't expect it, or accept it, when it is told through rap music or in films like The Matrix, it's not hard to find examples of a chosen one entering into a dangerous and fallen world with a destiny to restore and renew. I hope you find the hope of Christmas in unexpected places this year. After all, "It's Christmas, Yes It Is"! With all the talk about Mayan calendars and the end of the world, it is past time to discuss Christian understandings, and misunderstandings, about end-times prophecies. The New Testament in the Bible contains more than one. More often than not, though, Christians fail to recognize fulfilled prophecy and presume instead that everything in a book like Revelations refers to future events. For those living in Jerusalem, though, the world (or, more precisely, the "Jewish Age") ended centuries ago. There can be serious consequences when we fail to acknowledge the past, including events in history when the Bible itself was still being written. After speaking boldly about questions of sexual identity and unacceptable answers presented by the "religious right," it's important to turn the other cheek. I do not speak as someone who has always stood up for the rights of non-heterosexuals. No, I understand homophobia because I have experienced it. I have felt that irrational fear; and, even though I was much younger then, it's still important to put it to rest. I've recently seen a hashtag on Twitter -- #LeaveItIn2012. Let's leave homophobia in 2012. Ashes to ashes. Although this year is nowhere near the nightmare for the Bowl Championship Series that last year proved to be, it remains true that college football fans have been slighted as always. The bracket below shows the playoff system we could be watching. 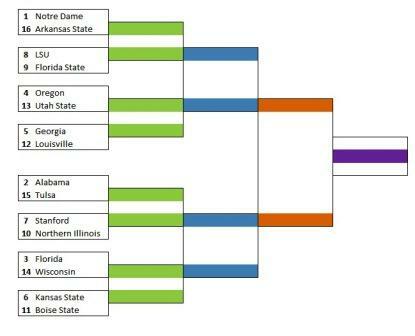 All 11 conference champions are seeded in a bracket with the next best 5 "at large" teams based on BCS ratings. The only adjustment I've made was moving Georgia up to avoid 1st- and 2nd-round rematches of games played in the regular season. I'm not suggesting that the decisions necessary to reach a "March Madness" type of bracket would be easy. Still, they are possible. If SEC teams, for example, just dropped their annual game against lower division opponents, the football season wouldn't be too long for any of these teams. As for other teams in bowl games, could those match-ups be any worse than they are this year even without a playoff system? Of course, I'm not suggesting that Arkansas State is likely to upset Notre Dame, or that Tulsa or Utah State might advance far into this tournament. As any college basketball fan would attest, though, they have earned the right to play. We may hesitate to conclude that it's an act of violence to deny that someone exists or that he or she is real. So much damage has been done, though, by denying that people are who they say they are and their rights can be compromised as a result. This may be a quiet violence, but it cuts to the very core of what "human" even means in the context of human rights. Evangelical Christianity has been increasingly guilty of this during the past five decades, and I call out a podcast that I've praised in the past as a frustrating example.